Located walking distance to downtown shopping, waterfront, Pioneer Square + other attractions! Conveniently located just 3 blocks from the University Link Light Rail stop. The theme of Kimpton Hotel Monaco Seattle is Whimsical, International, Fun, and Quirky! New outdoor patio and secret Karaoke room in Outlier! Also, The staff goes above and beyond. Many on the operations team have been with the team for 10+ years, making the guest experience unforgettable! This building was the old Pacific Northwest Bell Switching Station! Hosted evening wine hour, morning coffee & tea services, yoga mat in every room - with yoga channel, complimentary PUBLIC bicycles, Recently redesigned restaurant: Outlier! The airport is just a 35 minute drive or 40 minutes on the link light rail away. "Creating memorable experiences for our guests. Making them fall in love with the Kimpton Brand." "Their excitement! Our whole staff loves interacting with your travelers because they are ready to soak up all the city has to offer." "Each neighborhood has a really distinct personality and each has so much to offer. I'd encourage travelers to get away from the downtown corridor and see Pioneer Square, Ballard, Capitol Hill, Fremont, etc. Rent Kayaks/Paddle boards at Moss Bay! There's also a restaurant near there called "100 lb clam" that you can eat and drink at while you wait for your activity (first come first served). " 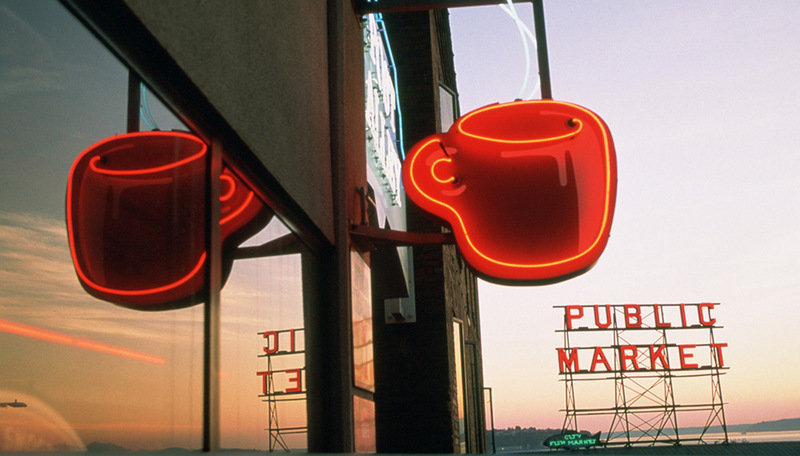 "Kerry Park (Queen Anne), Downtown Waterfront, and the Pike Place Market sign!" Have you stayed in this Kimpton hotel? How did you like it? Let us know in the comments!